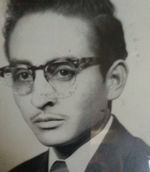 Manuel Zubiate Soriano, 88, passed away on August 3, 2018. He was born on March 11, 1930 to Inocencio and Delfina Soriano in Jacksboro, Texas. Manuel was a sheepshearer within the wool industry. Left to cherish his memory, his is wife of 67 years, Antonia Soriano, children, Maria Antonia Rodriguez (Santiago), Ruth Mayorga (Guadalupe), Romelia Villareal (Juan), Manuel Soriano (Carolyn), and Isabel Peralta (Ruben). Manuel also leaves behind his 16 grandchildren and 32 great grandchildren. To send flowers to the family of Manuel Zubiate Soriano, please visit our Heartfelt Sympathies Store.